The brown felt is for the soles. 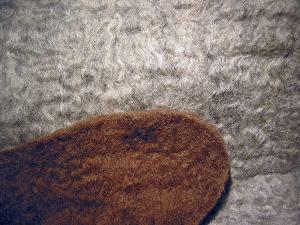 I made it from some Shetland moorit top and the reddish-brown is the natural color. I felted only loosly because the felt will be sandwiched between the slipper lining and non-skid material on the outside. I wanted the loose felt, with lots of airspace for insulating warmth and a cushy feel for walking on. I’ve already cut the sole out. For the slipper upper, I wanted to use some great Targee top because it’s so soft, but I didn’t have enough. So I decided use a grey Wensleydale cross top with a layer of Targee on the outside for softness. But when the felt dried, the Targee shrunk more and the Wensleydale released its natural waviness and sheen. I decided that I liked the look of the Wensleydale more, so that will be the outside. I feel so lucky to live within driving distance of Woodland Wool Works! I’m lining the slippers with a black, non-pilling velour. I’ll post a pic when they are finished. But tonight I’ll be crocheting wreaths and candy canes as I don’t have much longer to get those finished. Crochet is good for watching TV, and tonight The Legend Of Earthsea starts on The Sci Fi Channel.